Is this a bug in the Exchange Database (Powershell) sensor? How can I get correct channel values for my Exchange database? With PRTG version 15.3.18 we released several improvements for the Exchange Database (Powershell) sensor and the Exchange Mailbox (Powershell) sensor together with the new Exchange Database DAG (Powershell) sensor (see the release notes history for version 15.3.18.3271/3272). Unfortunately, this caused another small issue so that the channels Is Valid and Mounted of newly added Exchange Database sensors do not use the correct lookup definitions. Because of this you see the message 1 (configured lookup prtg.standardlookups.yesno_0based.stateyesok is empty or not available) in these channels. This happens only for Exchange Database sensors that you add to a PRTG installation with version 15.3.18 through 15.4.20. Open the Overview tab of the Exchange Database (Powershell) sensor. Open the settings of the channel Is Valid by clicking its name. For the Value Lookup setting choose the correct lookup prtg.standardlookups.exchangedag.yesno.stateyesok (most probably this is initially set to None). Choose the channel Mounted from the dropdown list at the top of the Edit Channel window to open its settings. 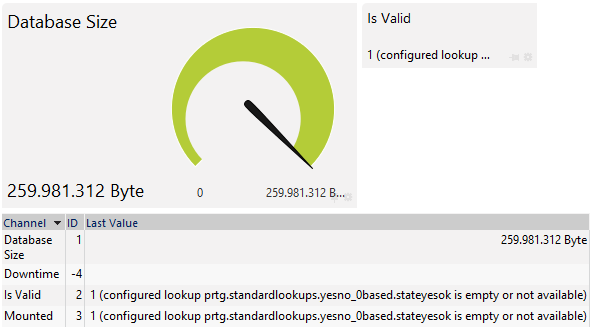 Choose the lookup prtg.standardlookups.exchangedag.yesno.stateyesok here as well in section Value Lookup. Click the Ok button to close the window and to save your changes. Note: If you have more than one Exchange Database (Powershell) sensor with malfunctioning sensor channels, you can use Multi-Edit for these sensors to choose the correct lookup file for all affected sensor channels at once. 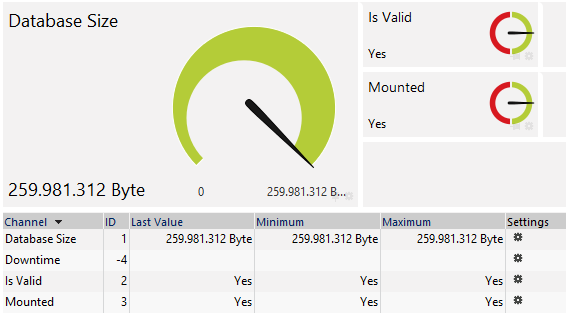 The Exchange Database (Powershell) sensor channels Is Valid and Mounted now show the correct lookup values Yes or No. We fixed this malfunction of newly added sensors for the upcoming PRTG version 15.4.21. If you add a new Exchange Database sensor to PRTG, the correct lookup is automatically used as of this version. Note: This fix does not apply to already existing Exchange Database sensors which were added in version 15.3.18 through 15.4.20, so they will not automatically use the correct lookup with version 15.4.21. Either you choose the lookup manually as described above or you have to add these sensors anew.